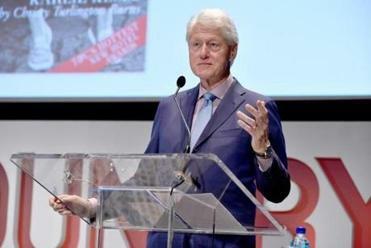 THE #METOO TRAIN has rolled over Bill Clinton, crushing him on its tracks. But he’s gotten a pass for so long that he doesn’t get it yet. Remember when he took the stage at the 2012 Democratic Convention as Barack Obama’s explainer in chief? The crowd roared and swooned as “The Big Dog” out of Arkansas strode to the podium. He bit his lip. He felt our pain. With arched eyebrows and a hoarse whisper, he told us why we needed Obama better than Obama could ever tell us himself. Democrats fell in love again with the bad boy who made them feel so good. Pundits gushed. So did I, I regret to admit, since I knew all about the women who accused him of sexual misconduct — Monica Lewinsky, Kathleen Willey, Paula Jones, and Juanita Broaddrick, who’d credibly claimed that Bill Clinton violently raped her. On that convention night and so many others, lots of us — including leaders of organized feminism — dismissed and diminished Bill Clinton’s accusers. Here was this brilliant politician, perhaps the most talented in decades, a liberal, a genius, “a great man.” And who were these women, really? If Clinton feels sorry for anyone, it’s for himself. Read: Has Bill Clinton outrun the statute of limitations? They did not matter. And that’s pretty horrible. Before the #MeToo movement, we routinely dismissed and diminished all sorts of women who made claims against “great men” and not-so-great men. We didn’t believe women and fretted over men’s sullied careers. If such men weren’t violent or retaliatory or nauseating ogres, we made excuses for them, even when we were their victims: Oh, this is just how the working world works. Oh, he’s a not such a bad guy — except when he puts his hand on my thigh, and squeezes. Oh, just humor him. Don’t get him mad, or you won’t get that raise or the nice time off. Remember when incredulous senators wondered how Anita Hill — who testified against Clarence Thomas during his confirmation hearings for the Supreme Court, saying he sexually harassed her — could possibly follow him to a second job, call him on the phone, even give him a ride to the airport? She did it for the same reason that a lot of us asked for recommendations or career advice from men who harassed us: They were also our mentors. Their power and connections could open up unlimited opportunities. Their animus could shut us down. Was it wrong to think like that, or to ask favors from these men? Probably. Not our finest hour. Yet it was practical. Redress was rare. Options were limited. Women were trapped. Bill Clinton, who’s made no amends for his multiple transgressions, has shown he understands none of this. He still strides to the stage like a great man, floating above the fray, concerned only with great issues, such as war and peace and hunger. On his book tour last week, he seemed insulted to be called to account for something, to him, as inconsequential as what he did to an intern right out of college all those years ago. He could barely manage a self-pitying apology for the long-suffering and maligned Monica Lewinsky. Meanwhile, the Kennedy family embarrassed itself last week by giving Clinton a starring role at Robert F. Kennedy’s memorial service. Considering that family’s own troubled history with women, choosing Clinton seemed as tone-deaf as the man himself. But Democrats running for office in 2018 can’t be so oblivious. To ask Clinton to campaign with them now means they’re OK with powerful men preying on powerless women. Let me go out on a limb here and predict there will be few, if any, Democrats sending invites to “The Big Dog” this year. At 71, he’s lived a charmed life for decades. But the earth has shifted, and better late than never, Bill Clinton is done.